The city of Albi is situated in south-west France, along the banks of the River Tarn, in the department of the same name. The city appears pleasing to the eye as its buildings, having been constructed with a distinctive red brick, give a rosy glow in the warm sunlight which frequently blesses the area. The inhabitants of Albi are known as Albigensians, a term most usually associated with the Crusades and the Wars of Religion. The city was indeed a centre of Catharism, and the resulting troubles are well documented in the history of the town. However modern life is sweet in Albi, as the city is a prosperous and beautiful capital of its department. 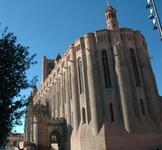 Albi is completely dominated by its wonderful cathedral, the Cathedrale Ste. Cécile, which is so vast and well fortified it took two centuries to build! Overlooking the River Tarn, the cathedral is a truly awe inspiring sight, and if you go inside (which you really should) this sense of awe will be magnified. The cathedral possesses an ornate and rich décor and also has some fabulous artworks, including paintings, frescoes and sculptures. This cathedral is one of the most visited and best loved buildings in France, and is the largest brick constructed building in the world. Albi supplies everything you will need to enjoy the best of France. There are shops, supermarkets, banks, schools and other facilities, and Albi is also known for its superb restaurants where the famous gastronomy of the Tarn can be enjoyed to the full. Here you can try the rich Foie Gras followed by locally reared duck and then wash it all down with a glass of Gaillac, the wine for which this region is justifiably acclaimed. The city has numerous cultural delights, including an extensive collection of the works of the artist Toulouse-Lautrec, who was born and raised in Albi. This collection, which was donated to the city by the artist's parents, offers a unique opportunity to trace the development of the painter's distinctive style. The Toulouse-Lautrec Museum is housed within the magnificent Palais de la Berbie, the Episcopal Palace of Albi which is completely restored to its original glory. You can also visit the splendid gardens of the palace, which are open to the public every day. Besides the cathedral and the palace there is the lovely old bridge, the Pont Vieux. This bridge is one hundred and fifty metres long, and is supported by eight arches. The Pont Vieux is a very distinctive feature of Albi, and the sight of this and the cathedral instantly call to mind the sights, sounds and scents of this lovely city. Although there is enough to see and do in Albi to keep you very happily occupied for a great many days, there may come a time when you want to widen your horizons and take a look at the Tarn countryside. The landscape of trees and vineyards with mountains in the distance and rivers rushing by suggests a million possible activities for the energetic among you, and almost anything you can think of is available here. This is prime walking and cycling country and equestrians will love the extensive tracks and trails for horse-riding. Adventure sports abound too, with the dramatic gorges of the Tarn offering opportunities to try canyoning, rafting and rock climbing. Travelling to Albi is easy due to the proximity of Toulouse, with its international airport and TGV station. The British Midlands airline bmi have flights into Toulouse from Manchester and from Scotland, and for those wishing to travel from the south of England, cut price airline easyJet have flights to Toulouse from Bristol and Gatwick. Rail travel is another handy way to reach Albi. Take the Eurostar from London to Paris or Lille, and then catch the TGV fast train to Toulouse. From there you can reach Albi by connecting bus or train. Property prices around Albi have increased significantly in recent years, due to improved transport links and the demand for traditional French property in beautiful countryside. Albi offers all this along with a warm, sunny Mediterranean climate, so it is easy to see why the area is popular! In comparison with some parts of France, however, such as the Alpine resorts and the Cotes D'Azur, Albi is still a place where you can find beautiful property at bargain prices. There is such an abundance of lovely country properties in the Tarn that the rural dream of an old stone farmhouse surrounded by its own land is a real possibility here. Do you know Albi better than we do? Do you have photos of Albi? Albi is found in south-west France, in the north of the department of Tarn, close to Tarn's neighbour, Aveyron. Access: By air: Fly to Toulouse with bmibaby. By train: Take Eurostar from London to Paris or Lille, then a TGV to Toulouse. Economy: The economy of Albi is dynamic and diverse. Principal industries are tourism, cement, dyes, flour, glass and synthetic textiles. Interesting fact: The artist Henri Toulouse-Lautrec was born in Albi in 1864.